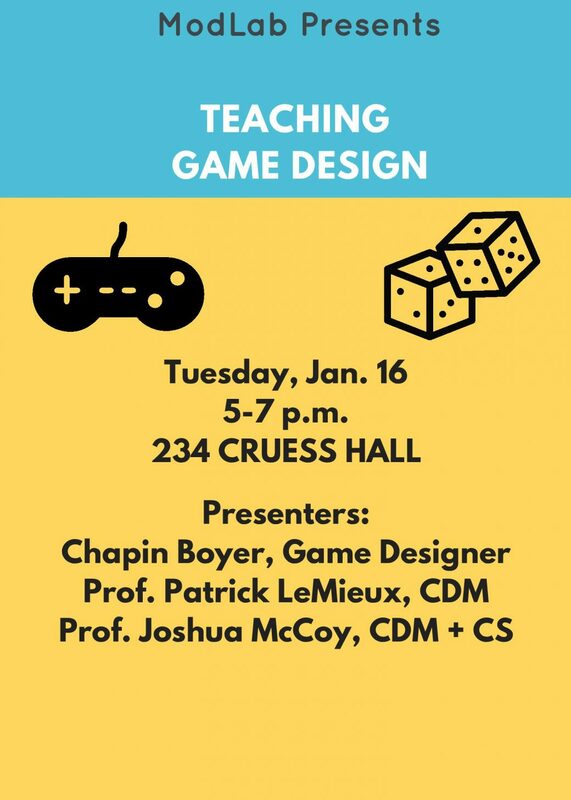 The ModLab is pleased to announce that we will be presenting Teaching Game Design, the third and final Games and Pedagogy workshop, on Tuesday, January 16, from 5-7 p.m. in 234 Cruess Hall. This workshop will focus on incorporating game design lessons into classes in the humanities and humanistic social sciences. We welcome instructors from all disciplinary backgrounds and levels of technical expertise. Our presenters will include game designer Chapin Boyer, Prof. Patrick LeMieux (Cinema & Digital Media), and Prof. Joshua McCoy (Cinema & Digital Media and Computer Science). Participants are encouraged to bring their own laptops. We also recommend downloading Twine Version 1.4.2 at http://twinery.org/ and setting up an itch.io account at https://itch.io/. See the attached flyer for additional details. Please circulate this widely. If you have any questions or concerns, feel free to contact me at jscarroll@ucdavis.edu.